Screenshot of a Voyager 2 encounter in the 'Elite: Dangerous' universe. Launched in 1977, the twin NASA Voyager probes have been coasting their way through the outermost reaches of the solar system. Voyager 1 has even breached the sun's outermost magnetic boundary, the heliopause, where the outward pressure of the solar wind balances with the interstellar medium, and is now humanity's first interstellar emissary. Both Voyagers have a power supply, albeit dwindling, for the next few years. But once those plutonium power planets die, radio communications will cease and that’s the last time we'll be in touch with our intrepid space explorers. There's a fun thought experiment that one day in the future, when humanity has the technological prowess to build spacecraft capable of traveling speeds at an appreciable fraction of (or faster than) the speed of light, although the Voyager probes will have had a decades- or centuries-long head start, we could catch up to the probes and overtake them as we explore the stars. Our future selves may even calculate the probes’ location and mount an expedition to visit the archaeological curiosities and marvel at the primitive, yet inspirational, technology their ancestors once had. Now, in a rather genius move by UK-based online game developer Frontier Developments, we don't have to wait until the invention of the warp drive to see the Voyager probes once more. 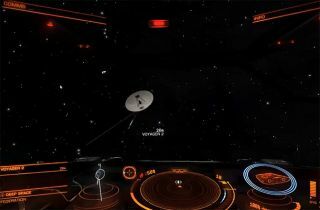 Hidden in the recently released 'Elite: Dangerous', a crowd-funded reboot of the famous 1980s game 'Elite', both Voyager 1 and Voyager 2 exist as real entities that can be sought out and explored. The massively multiplayer 'Elite' universe is boundless, using open-ended galaxy modeled on our Milky Way. Realized by Redditor Goldenvale earlier this month, he calculated Voyager 2's trajectory and plotted where the spacecraft would likely be in the game’s timeframe, in the year 3300 AD. After being fact-checked by fellow Reddit gamers, it turns out that Goldenvale's math checked out and tallied with the 'Elite: Dangerous' universe. In 3300 AD, the probe should be 664.9 billion kilometers (413.1 billion miles) from Earth. That may sound far, but on interstellar scales, that’s only 0.07 light-years away. Considering the nearest neighboring star, Proxima Centauri, is over 4 light-years away, by the year 3300, Voyager 2 will have barely stepped off the interstellar porch. In a wonderful additional touch, the developers have included the audio from the Voyagers' Golden Record — greetings recorded in 55 different languages. As an avid space game enthusiast, I can't wait to explore the 'Elite: Dangerous' universe. Ever since playing the 'Elite' sequel 'Frontier: Elite II' in the 1990s, I've been fascinated by the open-world game play that allows you to explore a boundless universe. And, by the looks of the videos showing gamers' experiences, the ultra-realistic feel of being in space plus the cool addition of realistic locations of the Voyager probes (plus other nice touches that have yet to be revealed) should make for a mind-blowing experience.